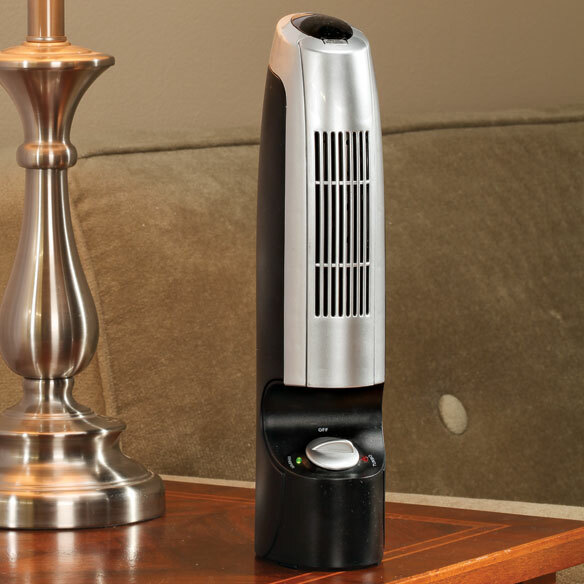 Breathe easy with the home air ionizer. Portable air cleaner helps remove pollutants such as dust, pollen, pet dander, odors, smoke, fungus, soot and more. Air purifier’s money-saving metal filter can be wiped clean and used again and again. 2 energy-efficient modes: whisper and turbo. Compact size perfect for table or shelf. 11 3/4”H x 3”W x 4”D with 6 ft. cord. I bought this for my bathroom in my apartment because the lady below me smokes and it comes up through my bathroom floor. So I got this and it has been a lifesaver. I run it all day long then at night when I go to bed I turn it off. It's perfect for a small space. Instant fresh air. Just what I wanted. May need some help getting the filter off. I am an outsider cigarette smoker, but occasionally cheat to run to the downstairs half-bath/restroom. This little unit takes out the smell of smoke (and other unmentionable odors) within minutes that can linger in my little 1/2 bath...I give it a thumbs up for small areas (14'x14' max). work so that it turns on and the light turns on to show it is operating. This I really need because it's going to help me breath better. To reduce allergens that cause damage to my health. Because it has a cleanable steel filter and is much more sanitary than buying paper disposable filters. What brand is the air lonizer? I need this for good nasal health. my apt.is very dry i need something to clear the dryness. I have pleasant experiences with the negetive ions. Next best thing to being at the ocean. Been looking for a small air purfier. Because it doesn't need any filters to be replaced at. I have been looking for this item and now have found it at a decent price!!!! To keep the air cleaner. recommended by friend for clearing out smoke. This air purifier is great for allergies. Because I've been using these air ionizer units since 2010,and need to replace the old ones. Long lasting and efficient. To clean the air in my room. To make room have fresher air! I have used Ionizers in my home for years. They help clean the air if you have pets and especially if you are a smoker. I wanted a small Ionizer to place next to the bed. They help keep my nose from plugging up as I sleep. I have needed an ionizer for a long time. I made the decision to purchase this one based on a very positive review on the site. My AirPurifier requires air filters that must be purchased every 3 to 6 mos. This one has metal filters that can be washed and reused. I hope it works well. I liked its small, neat size. If it works as well as I hope I will probably purchase one or two more. Also, I like that you can clean the filter that is already in it. Cooped up all day in my apartment through the winter may help with coughing & sneezing. To help relieve my husband's allergies. BEST ANSWER: No noise. At first I thought it wasn't on, but it was. Does it put out possible Ionizes ? BEST ANSWER: Thank you for your question. Air ionizers create negative ions using electricity and then discharge them into the air. These negative ions attach to positively charged particles in the room, such as dust, bacteria, pollen, smoke, and other allergens. The positively charged particles and negative ions bond together to create dense dirt particles that cannot float in the air. These heavier dirt particles fall to the ground and wait to be swept up at a later time. We hope this information will be of help to you. Cold air coming from it. Is that normal? BEST ANSWER: Thank you for your question. 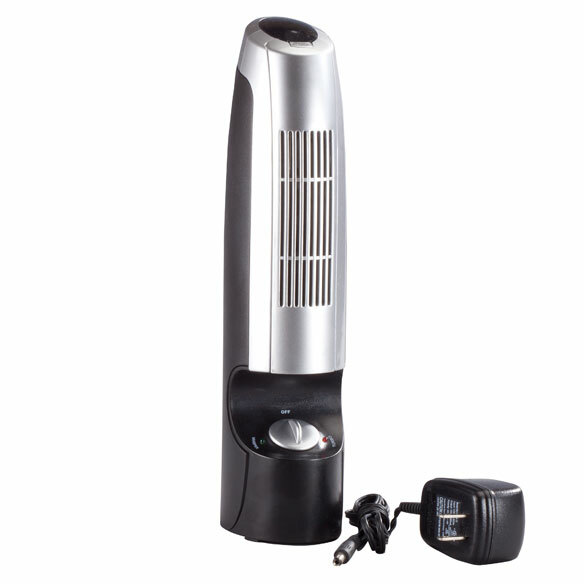 Air purifier’s money-saving metal filter can be wiped clean and used again and again. We hope this information will be of help to you.